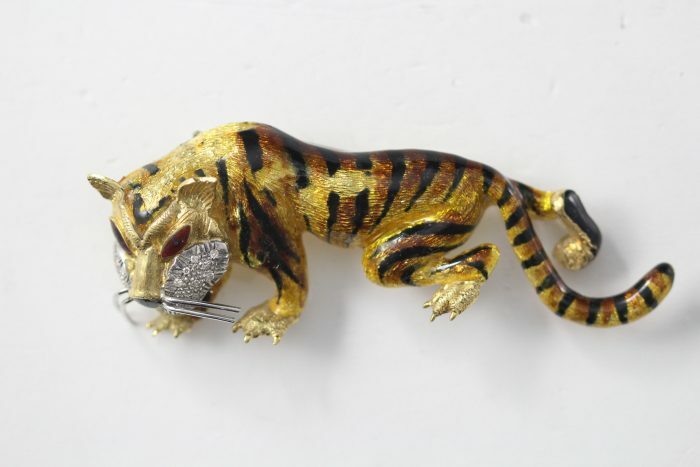 This tiger brooch is sure to bring out your exotic side and would make an excellent addition to any collection! 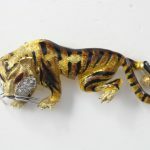 The brooch is made of solid 18 Karat gold and has an stunning enamel overlay to portray the colors of the tiger’s stripes. His face features piercing eyes of glowing red enamel and 19 small diamonds on his cheeks. The Brooch features a unique locking pin clasp for a secure hold. There is significant wear on his belly, back and head with pieces of enamel missing, but otherwise it is in good condition.